The National Football League as a whole generates ten billion American dollars every season. The Dallas Cowboys, the most valuable team in the league, had an estimated value of four billion dollars in 2015. There are, on average, sixty-eight thousand spectators at any given game. The Super Bowl is one of the highest rated events on television, internationally, every year. The average price of a thirty second television commercial during the Super Bowl is four million dollars. That sounds more like an entertainment product than a sport. Concussion examines an instance in which a brand, or a commercial institution, became more important than life. It’s not the first such instance, it’s certainly not the last and it’s absolutely not a rarity. That the NFL occupies a significant portion of public consciousness ultimately meant that this instance gained universal acknowledgement. There’s a strong similarity between Concussion and the subject matter of Michael Mann’s The Insider. In that film, former tobacco company executive Jeffrey Wigand and television producer Lowell Bergman work to expose the threats of smoking that cigarette corporations concealed for decades. But smoking isn’t a national sport. It’s not something we encourage our children to engage in. Bennet Omalu (Will Smith) is a spectacularly bright forensic pathologist with the Allegheny County coroner’s office. Former Pittsburgh Steeler’s centre Mike Webster (David Morse) is found dead in his pickup truck after months of bizarre and self-harmful behaviour. The CAT scan indicates no signs of trouble, which puzzles Omalu, who subsequently orders a thorough autopsy of Webster’s brain. That Omalu uncovers severe brain damage in Webster, a condition he dubs chronic traumatic encephalopathy (CTE), mightn’t appear exceptionally revelatory but then smoking was never considered particularly healthy before Wigand and Bergman compelled the tobacco companies to tell the truth. The concern is public awareness, but in both cases, the organisations responsible for answers denied the harm their products caused the general public. It’s not so much of a stretch to imagine the influence of a company such as the NFL on the the monumental number of people influenced by the sport. More problematic still is the intricate infrastructure threatened by Omalu’s findings; that ten billion dollars the NFL generates every year. Moreover, how does a national pastime, revealed as potentially very life threatening, adapt after such a revelation? Omalu is dispassionate about football but eager to promote his findings because of his enthusiasm for knowledge and science. More crucially, it’s the right thing to do. He’s subsequently rejected and discredited by the NFL. 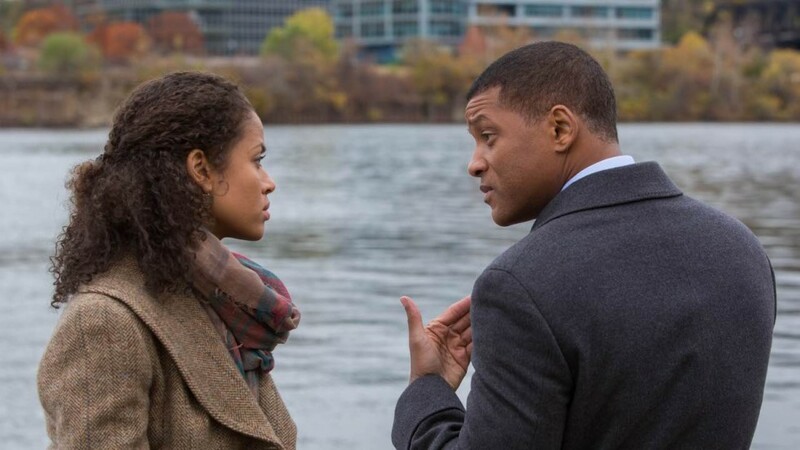 The naturally compelling subject matter of Concussion is betrayed by director Peter Landesman’s inclination toward melodrama. There’s a lot of gripping material regarding the NFL’s reaction to Omalu’s claims that’s diluted by a focus on Omalu’s family life. Omalu is from Nigeria, an aspect of character that Will Smith has unfortunately decided to engage with to the degree of caricature. Smith may have perfected the impersonation, but any attempt by a man so famous to embody someone else so extremely has to be unsuccessful, simply because Smith himself is such a recognizable figure. There’s two vague stories co-existing in Concussion. One is the story of an enormous corporation, that’s also responsible for a recreation that’s integral to a nation’s identity, stunned by a threatening revelation. The other story is about an outsider with the strength of will to stand up to the spirit of a nation in the name of decency. Landesman’s approach to one alienates the other. There’s the sense that significant information was jettisoned in the name of sentimentality. 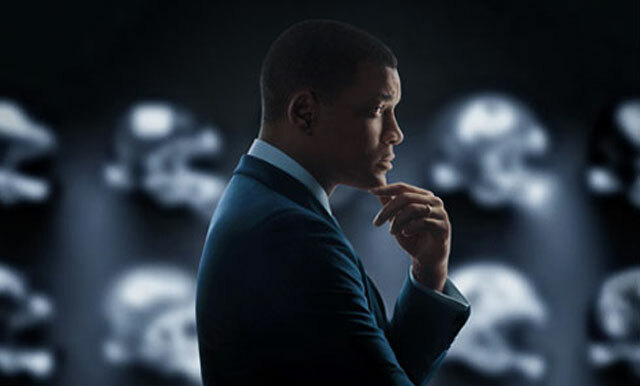 Ultimately, Concussion neither engages fully emotionally nor intellectually.